Throw a sirloin steak on the barbecue for this summer classic. 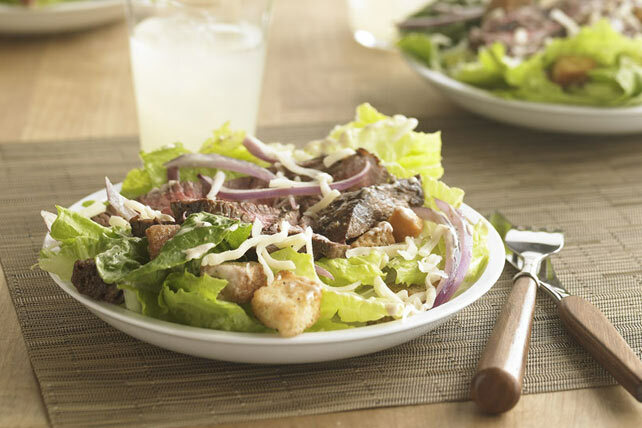 While it's grilling, prepare a crisp Caesar salad - dinner is served! Heat barbecue to medium-high heat. Grill steak 5 min. on each side or until done (160°F). Transfer to cutting board; let stand 5 min. Meanwhile, toss lettuce with onions and croutons. Add dressing; mix lightly. Place on 4 serving plates. Cut steak into thin slices; place over salads. Sprinkle with cheese. Never place cooked foods on the same plate used for raw foods. Use clean dishes and utensils to serve the food and not those used in preparation.